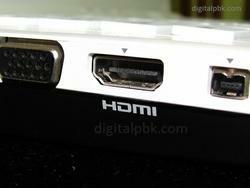 What does HDMI port on laptop do ? HDMI or High Definition Multimedia Interface, is a new type of technology than enables inter connection of Audio - Visual equipment with each other. HDMI port is present on laptops, modern LCD, LED televisions, DVD / BluRay Players, the new Nokia N8 mobile phone, Sony Playstation 3 etc. It is High Definition because it can support high data transfer rates (~10 Gbps) which is required to stream High Definition Audio / Video. (High Definition or HD is 1080p). Compared to other forms of cable interconnection methods such as the bulky VGA cable, S-Video, RCA connectors, HDMI is capable of transmitting both Audio and Video data in one simple cable. Less cables less messy. Let us look at a list of HDMI capable laptops. The following laptops have HDMI ports.